I'm taking a break from my blog break today to finally reveal my secret project from the beginning of the year! Late last year, I had asked Marvel if they would consider a painted approach for any of their upcoming movies. To prove I was up to the task, I did a Captain America poster "on spec" (which was later used as the cover to a movie tie-in comic). As it turned out, the job was already taken, but they liked my work well enough to commission a "vintage" poster that would be given as a gift to the entire cast and crew. The prints, limited to 100 or so, were reproduced at actual size. Even Stan Lee got one! I was given access to a vast collection of production stills—each emblazoned with a watermark pattern of my name—from which I selected my favorites. All of the lettering is hand-drawn, with the exception of the small credits at the top and bottom (I ran out of steam). While I did some post-production work in Photoshop, the original looks more or less like what you see here. You'll have to wait until I finish Daredevil #3 before I share some of the behind-the-scenes material, but the "Hitler getting punched" reference will be well worth the wait. I couldn't be more excited to finally share this with everyone and I can't wait to see the movie, which comes out next month. And before I get back to drawing Daredevil, I'd also like to thank Stephen Broussard, Kevin Feige, Joe Quesada, and Tom Glinkowski for giving me the opportunity and facilitating the entire process. This was the first time I pursued a project at Marvel of my own volition (as opposed to being offered one) and I was very happy with the results. Makes me want to try out a new other ideas... but that will have to wait for now. Great Job--Paolo! The art is magnificent--so is the idea...it is good to see your vision taken root. Incredible dude. This is some seriously awesome and inspiring work. Well done. I can just imagine you repeating to yourself in your best movie voice, "In a world..." over and over again as you made this. Great work, sir. On top of everything else...I love the color palette! fantastic and powerful! i very much hope one day this is a poster or print for sale to the public. Oh, man! This is awesome! HQ, pleeease. Honestly, your "and featuring the Howling Commandos" text and small figures got me more excited for this film than anything else I've seen so far. This looks amazing. I prefer the illustrated movie poster. The poster is amazing. Good job. Wow. That is so amazing. I'd love to see you do more movie posters. Great and amazing poster and wow I wish it were used as one of the official promo posters! Of course in a way it is now in a virtual sense seeing it is now all over the web! ;) You really capture that feeling I hope this movie also has. Your work is just fantastic man keep it going!!! So awesome. I wish I could see this along with the other posters in the Subway and in theaters. OUTRAGEOUS! This is great! I've been hearing a lot lately about movies posters all looking the same and lacking artistic flare. This is a perfect example of what people miss. Great work and technique! The figures, lettering and colors are tremendous! Thanks for sharing!!! Why is this not hanging in every movie theater in America right now? This is the most awesome thing I've ever seen. I can't believe Marvel would NOT want to use this. It totally fits the theme of the film. Outstanding work, sir! Should I ever have stupid amounts of disposable income, I would insist upon commissioning a portrait. I've linked to this post from my own blog post about this amazing design. I agree, this should be the offical poster image for the film! Yeah this poster is crazy awesome! I actually saw it on IAMROGUE! http://bit.ly/mIAnBT Good job man! I too, would love a nice print of this! Hopefully they make them available for sale! It's beautiful! I love a man who can letter as well as draw. Calligraphy art is vanishing so fast. Beautiful job on the entire poster. Awesome poster, please make this available to have prints made on CafePress or something. This will look great in my home theater! Super awesome! And way to be innovative and shoot for the stars! Bringing painted posters back! YES!!! Good job! Thanks so much, everybody! It was a dream to work on and I'm so happy to see that people seem to like it. Can't wait to see the actual movie now. And Anonymous, aside from it being a direct homage to Cap #1... he's just that fast. 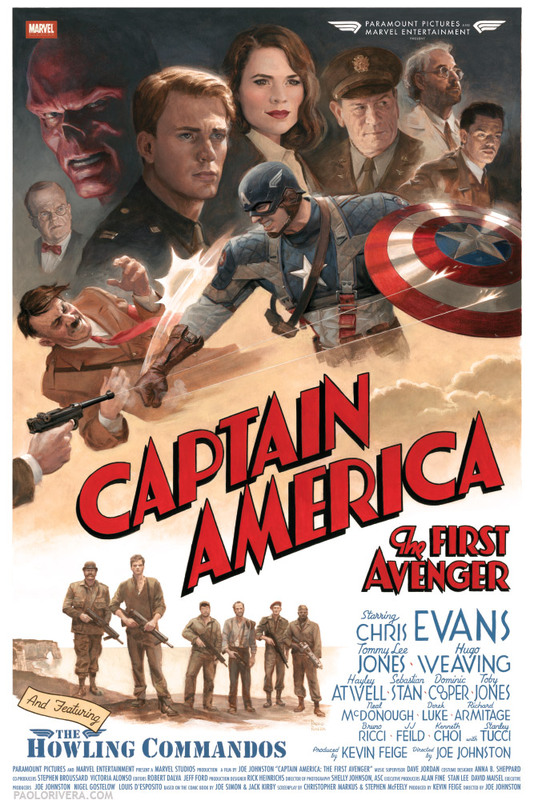 I am not a fan of Captain America by any stretch and this is easily one of my favourite movie posters...ever! Everything just works together so well. Please tell me this poster won't be limited to just 100. I want this poster for my studio now !It is an inspirated and beautiful work!Thank you ,paolo! 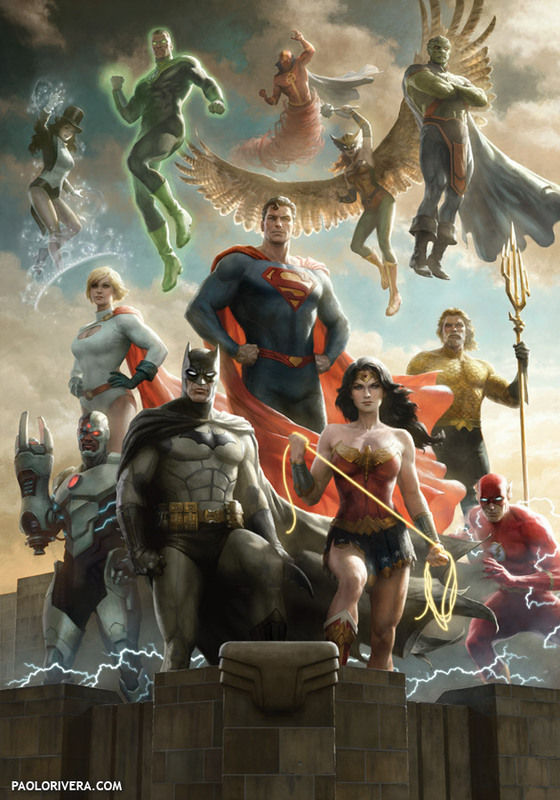 This definitely gets my vote for A) This SHOULD be an official poster (or like the Brothers Hildebrandt STAR WARS poster, an unofficial official poster for promotion to the public), and B) I hope this does become available to fans. If the movie is half as good as this, it gets my entertainment dollar. As a designer and art director, I know this would win "in competition" as well. This most certainly should be an official poster and I DEFINITELY want one should they and you decide to put prints up for sale. Definitely think you should sell prints of this! I'd love to have one! Thanks, everybody. Still no word on prints, but I'm trying to see if I can include it in an art book that I'll be publishing through Marvel. We shall see. Wow, if you ever decide to sell these,even as cheap prints, I will buy one in a heart beat. I want this for my living room. Thanks, Will. I'm putting together a Marvel art book very soon. I'll ask if I can at least include it there. Nice work. I hope there's more Captain America posters to come. I'm afraid not. The only place that it was reproduced, as far as I know, is the "Art of" book. Great poster. Feels like a real 1940's movie poster. This is amazing Paolo! You really do have your artwork and craft mastered. I like the feel of the poster. I think having a vintage feel is really part of its charm. Given that it’s limited, the production company must really include your artwork in their archives, even just for posterity’s sake. Great job! This is a great vintage art. Vintage posters are beautiful to look at, but being able to create them is something special. It’s good to recognize that laziness and neglect lead to ruin, but not all ruin is a result of laziness or neglect.